Your refrigerator is probably the most used and abused appliance in your home. It’s open morning till night and doesn’t take a day off. Every member of the household uses it to store food, beverages and even small items that need to be kept in cooler temperatures. Clutter here, there and everywhere! The fridge is also victim to numerous door slams, liquid spills, bad odors and (gasp!) food spoilage. Because its contents are not visible to prying eyes, many put aside (or sometimes intentionally forget) cleaning their refrigerators. Your fridge sadly ends up being stinky, cramped and cluttered for months. Before any harm could befall your family because of your refrigerator’s current dingy state, you should make it a habit to de-clutter your fridge once a week. As a child growing up in a big household, one of my tasks was to do a weekly refrigerator cleanup. It was a chore I didn’t enjoy (any child wouldn’t, really) but now that I have my own home, I’m glad I’ve been taught the basics of cleaning our refrigerator. Your refrigerator is there to keep your food fresh, so as a rule, it should be as clean as possible. One question, though, is how often you should clean it. Ideally, weekly cleaning is best but if you don’t have time, once every two weeks is good enough. Daily: Make sure you wipe away spills immediately, especially if they’re milk or sugary liquid, so they won’t set and bacteria won’t grow. 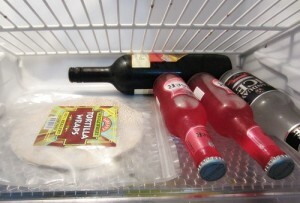 Before storing bottles like ketchup and salad dressing inside the fridge, wipe the neck and mouths clean. Weekly/Bi-weekly: Wipe shelves and racks with a washcloth dampened with baking soda and hot water. Don’t use soap when cleaning or your food will end up (and even taste) soapy. Pull out the racks, crisper, and side shelves then run them under tap water with a good scrubbing down to remove food stains and dried-up liquid. A little baking soda also goes a long, long way. It’s known as a great cleaning agent and deodorizer, too! To make a baking soda solution, just mix two tablespoons of baking soda with 1 quart of warm water and use it to wipe your fridge clean. 2. 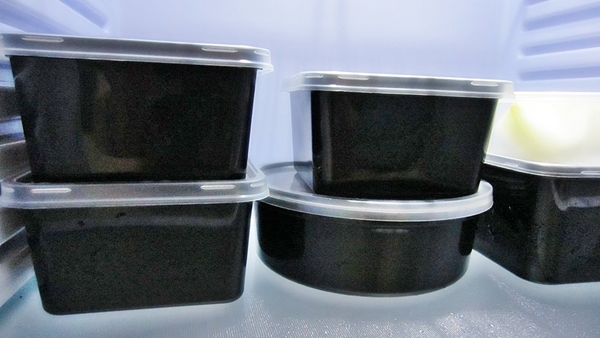 Seal leftover food in airtight containers. One great way to keep clutter at bay is by placing food and other items inside containers. Adding labels on each container also helps you to easily identify its contents, or you can use easy-to-apply labels on the bins to know what items are inside.